Puerto Rico, an unincorporated U.S. territory, is home to approximately 3.5 million people. In September 2017, Hurricane Maria, the deadliest storm of the 2017 season and a Category 5 hurricane, made landfall in the Caribbean. The storm was catastrophic for Puerto Rico, obliterating infrastructure, causing island-wide power failure and water shortages, and resulting in an unconfirmed death toll. The history of European colonization and U.S. paternalism in Puerto Rico resulted in a debt crisis and thus a neglected built environment, vulnerable to disaster. After Hurricane Maria, a large dam was considered at risk for rupture, while ships with relief supplies sat in the harbor, unable to distribute food or water because roads were wiped out, vehicles were inoperable, and fuel was inaccessible. U.S. politicking, over issues such as the Jones Act and Medicaid as part of disaster funding, have potentially exacerbated and prolonged Puerto Rico’s recovery. At the end of December, 2017, one third of the island was still without power and thousands of Puerto Ricans had left for the U.S. mainland, perhaps permanently. FEMA, the Federal Emergency Management Agency, has found itself stretched thin and unable to respond to infrastructure needs, when basic survival needs have not yet been met for all residents. Though the situation is tenuous, CWB – USA received messages and inquiries from citizens, and an invitation from Puerto Rico’s Department of Education to tour throughout the island from February 3–18, 2018. 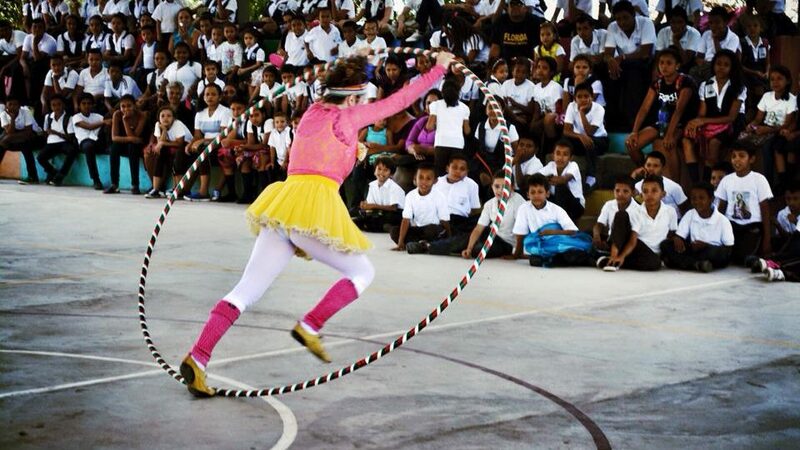 In partnership with the Circo Nacional Puerto Rico, DOE, Mercy Corps, and other partners, our team of four artists will perform in schools and community centers across the island. Our partners have offered us invaluable logistical support, and we are proud to financially sponsor this tour. Check back for more information as we release details about our tour itinerary, and for updates from our artists onsite.